Many people have pointed out that sequels are rarely as good as originals. National Treasure 2 wasn't quite as good as the original National Treasure. Don't even get me started about the 2nd and 3rd installments of Pirates of the Caribbean. I think the reason this happens is that in the original, people are trying to capture the ultimate: best treasure-hunt movie ever, best pirate movie ever. Whether they succeed in being the best is one question, but their high goal leads to high results. Sequels often aim lower. They do not want to be the best ever; they just want to repeat the first. The same players come out to take another bow. They end up with the quality of stale leftovers, warmed over and not quite fresh. The sequels that break this pattern are the ones that again seek to be the ultimate instead of being mere encores. In the early days of Christianity, followers of Christ were breaking new ground. The territory was the whole world. Teaching monotheism to pagans -- or a loving God to those who sacrificed their children -- was a bold move. Love of enemies was a bold move, still original in the history of religion. Forgiveness on a radical level challenged the standard compromise of love with resentment. And above all, the living memory of Christ fueled the growth of Christian thought and teachings. The true "first quest for the historical Jesus" was the one that put away Marcion and the Gnostics as those who preached a non-historical Christ. The origin of orthodoxy was loyalty to the realities of Christ. As much as I'm a fan of orthodoxy, an advocate of getting our teachings right, I have a caution: If we define "right teachings" in terms of Nicea, Constantinople, and Chalcedon, we become a sequel. Please bear in mind that this "sequelizing" happens even if every word from those councils should be proved true. We end by trying to hold on, not to the original revelation of God in Christ, but to decisions about what that meant. The age of the early theological giants of Christianity is largely the age of people who looked directly to Christ. By all means we should read them: but in order that with their insights we may surpass them in their knowledge of Christ, not that we should see them as the upper limit and so continue to fall short. The sequels that break the pattern of mediocrity are the ones that again seek to be the ultimate instead of being mere encores. Christian Reconciliation Carnival is now one year old. Thanks to all who hosted or participated in the previous year! This year my goal is to be a bit more organized and prepared for each carnival. Due to the realities of scheduling, this will mean scheduling the carnival quarterly rather than monthly. My hope is that, with a quarterly schedule, we can avoid the last-minute rush that has characterized the schedules for these carnivals. Again, thanks to all for their patience with me as a carnival organizer. I'm still learning my way around. Everyone who would like to host a carnival this year, please let me know either by email or in the comments. Please also indicate your preference for when to host. With the quarterly format, the Carnivals will have closing dates of roughly 03/31, 06/30, 09/30, and 12/31. If Christ is the Mediator between God and man, would a programmer say he is the Interface between God and Man? Some of Christ's self-titles verge on interface language: the gate, the door. If Christ is the image of God, would a movie-buff say he is God's Cameo Appearance? Would an artist call him God's self-portrait? I am an advocate of staying faithful to our ancient Christian roots. I have spent some time researching early Christianity, not only back to the days of the apostles but even back to the synagogue and Temple. As I have mentioned before, I would like to see today's church retrace its steps from the beginning to double-check its work. Anyone looking at today's church can tell that it has gone off the tracks at a few points. However, that does not mean that everyone who sets to rework their way through the problem will get it right. People both within and without Christianity have dived into the gap with different agendas, different levels of attention to detail, different levels of knowledge of the available historical sources, and so forth. Unfortunately, a certain percentage of these books have tended towards the sensationalist end of the spectrum. One such book titled Pagan Christianity? has recently come to my attention (h/t: Kevin at Familyhood Church, who referred to a book review at Kruse Kronicle, which in turn led to a web site where a sample chapter was available). Let me be plain: I do not intend this post to be a critique of this particular book, or even to be a discussion of this particular book. I am more interested in the general trend of people uncritically accepting nearly any claim against Christianity in the current atmosphere. Here I am more interested in the reception of the book than in the book itself, much like the reception of The Da Vinci Code was more telling than the book itself. 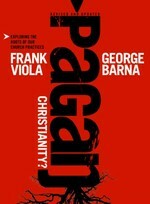 Focusing on the reception of the book, we find people willing to believe that Sunday school and organ music have a place in a book titled Pagan Christianity -- as if there were any connection between paganism and Sunday school or paganism and church organs, both things developed by Christians long after paganism had lost its force in the world. We find people willing to believe that a pastor's white robes were a late development based on pagan Greek practices, overlooking both that robes were the common dress of the people in the ancient world and that the faithful wearing white robes have several mentions in the New Testament. I have to wonder if the reviewer (or the book's authors) had ever attended services at a synagogue. If so, they would have recognized the traditional Christian liturgy as a direct descendant of the Jewish order of service, complete with Scripture readings and sermon. They would have recognized the clerical stole as a direct descendant of the Jewish prayer shawl that is worn to this day. These things were already in place in the synagogue, and can be seen in the New Testament references to then-current Jewish practices. Which brings us directly to the idea that a dedicated building was a late and pagan innovation. I again find myself wondering what they made of all the mentions of synagogues and the Temple in the Bible, all dedicated buildings, all in use by Jesus and the apostles. In addition to the rampant distrust of anything related to an established church, some part of the suspicion traces back to the low level of Biblical literacy that is current. There are suspicions that paid church staff may be a late corruption, despite a couple of references to paid church workers in the New Testament. And do you remember when Paul wrote to the church of Corinth to correct their practice of combining communion and the love feast? Here, some would want to revert to communion as potluck since it was mentioned in the Bible an early practice, overlooking the fact that it was mentioned as something that needed to be corrected. Paul wrote to criticize this practice and to create a separation between communion and potluck, ensuring a separate remembrance of Jesus' last supper with a solemnity bound to be forgotten at a feast. I am not sure whether the dates given in the book review for the various practices come from the book or the reviewer, but they are often off by centuries and occasionally by more like a thousand years. If there is one most-repeated mistake, it is overlooking the fact that Christianity traces its ancestry and the lion's share of its practices to Judaism. I do not want to spend an entire post looking only at the sensationalists discussing Sunday School and church organs under the heading of "Pagan Christianity". (Maybe they've heard one of the less talented organists play; there have been days when I sympathized.) I'd like to take the opportunity to re-frame some of the more legitimate criticisms that I saw offered in the book review linked above, whether from the reviewer or from the original book. For example, the fact that clergy now wear different clothes than the laity was framed as if the criticism were due to the fact that pagan Greek scholars also wore white robes. The badly-formed criticism detracts from a legitimate complaint: originally, sermons or commentaries on Scriptures were not the exclusive province of trained clergy. I wish everyone who discussed Christian history would attend synagogue services at least once in their lives. All the full adult members of the congregation wear prayer shawls (stoles), not just the rabbi. Any full adult member of the congregation can lead prayers and readings in the services -- and has done so at least once at his bar mitzvah. Granted that there has also been change in the practice of Judaism over the centuries, still the most ancient form of the bar mitzvah may have been simply the first time at which the newly-adult young man was called to read the Torah during the services. Again, the objection to a dedicated building is bound to be dismissed when it is framed as if a dedicated building itself were the problem. The synagogue and the Temple are too-obvious examples to the contrary; worshiping solely in houses is never commanded but is likely a response to persecution. Still, the kernel of truth is that worship should still be attached to home, family, friends, neighborhood, and hospitality. It has roots in all of these, and a dedicated building was never meant to be the sole place of worship or study, just as a public school was never meant to be the sole place of a child's learning. Reserving worship, Bible study, and prayer for a church building leads to an unhealthy segregation of "religion" from "real life". This leads straight to the next point about Sunday school. There's historically nothing pagan about the origins of Sunday school, and it seems to border on the irresponsible to discuss it under the heading of "pagan Christianity". Once again the framing of the argument threatens to rob it of its legitimate point. Sunday school is a great help for students whose parents are not Christian; I was first introduced to Christianity as a guest of my friend at her Sunday school. Still, for the Christian parents, it is a great loss not to be involved in the Christian education of our own children, both for their sake and for our own. It makes the parent somewhat less responsible for the bond between the child and church (i.e. the assembly of faithful believers). It may deprive the child of the chance to hear his own parents discuss religion at any length, since the parent may not recognize the need. The parents, in turn, may not develop or mature in their own ideas in the same way as if they held onto their primary responsibility for teaching their children. At some times and places in Christian history it was considered the parents' responsibility to teach the children at home. I would be glad to see reform in the church -- not a renouncing of church buildings but a welcome of family worship and Bible study back into the home, not a renouncing of communion but a comparable dedication to fellowship, not a renouncing of Sunday school but an involvement of the family in the work and life and knowledge of the kingdom of God. I would be glad to see, not a renouncing of the more admirable part of the special training of clergy, but wider-open doors to lay leadership in the service. If there is one common thread to the complaints, it is that it takes following Christ out of our personal hands and puts it into someone else's hands. It should be no surprise when people feel less involved, are less likely to come, and are less likely to teach their children. The beatitudes – the series of blessings Jesus spoke at the beginning of the Sermon on the Mount – are at times taken as moral instruction. While we certainly can take moral instruction from them, they are first and foremost blessings. Jesus begins his teaching ministry with a revelation of God: the proclamation of the God who blesses. Jesus’ blessings, like all of God’s blessings, are a promise. They are a promise that God takes notice of us, that God remembers us. They are a promise of God’s faithfulness to his creation. The blessings of the beatitudes are focused on proclaiming God’s goodness to those who do not now see it: the poor, the mourning, the meek, the hungry, the merciful, the pure in heart, the peacemakers, the persecuted. The beatitudes proclaim God’s promise that their faithfulness and hardship are known to God and will not be forgotten. Jesus’ proclamation of the God who blesses is the ground of our hope. Today's Sunday School lesson was on John the Baptist -- not on the baptism of Christ, but on preparing the way (Luke 3). Tax collectors and soldiers were among those who came to John to be baptized. He told the tax collectors not to collect more than required, told the soldiers not to extort money but to be content with their pay. He told all the people who had extra to share with those in need. So here is the question I put to my Sunday School class: Of all the people we read about today (John the Baptist, all the people who came to him, the tax collectors, the soldiers), who was on a mission from God? We're all on a mission from God. Not to downplay John the Baptist or any preacher of the word: part of his mission from God was to help everyone else see their mission from God. Old Testament, Hebrew Bible, or Tanakh? Update: Japhy has also written on this topic, covering some additional ground. In some circles there is a movement to reconsider the use of the term "Old Testament." This change is advocated by some within Judaism because of its implications that the New Testament supersedes the Old Testament. The replacement terms suggested, "Hebrew Bible" and "Christian Bible," are in theory supposed to be confessionally neutral. But each set of terms carries with it a set of confessional suppositions. The term "Hebrew Bible" implies that those books are for the Hebrews and is a closed set of books for the Hebrews; it rejects the idea of a New Testament that is for the Hebrews as well. The term "Christian Bible" implies that those books belong to "another religion" (an idea the Jewish authors of those books rejected); it implies those books do not apply to Jews or Muslims or Buddhists. It bypasses the good news of God's covenant for the whole world, a new covenant which is not merely for all nations other than Israel, but a new covenant which includes Israel as the firstborn among the nations. "Hebrew Bible and Christian Bible" confesses religious pluralism and sidelines the idea that God might have revealed himself to the whole world though the Jewish Messiah; the terms marginalize any thought of a truth claim in favor of a comfortable "proprietary Scripture" formula. It establishes a sort of religious non-interference pact whose price tag is the universality of God's message and the brotherhood of all mankind under God's new covenant. It also insulates the Hebrew Bible from the idea that there might be fulfillment of its promises in the Messiah who died, the Messiah who suffered with his people, the Messiah who was both a light to the Gentiles and a glory to his own people, Israel. It pigeonholes Jesus as a merely partisan question rather than as the incarnate, living and breathing Torah of God. If I were to use the term "Hebrew Bible" for the one set of books, I would use the term "Worldwide Bible" for the other, since it reveals the Torah going forth from Jerusalem into all the world under the banner of the Messiah. I have some sympathy with the distaste for calling a collection of Scriptures the "Old" Testament. If I were to avoid using "Old" Testament, I might say "First Testament" or "Early Testaments". True enough about the "old" part: nobody has performed the morning and evening sacrifices since the Romans demolished the Temple in 70 A.D.; there is definitely something old about it not merely in anciency but also in terms of non-survival to the modern world. The annual festivals have not been observed as prescribed by the Torah in nearly 2000 years; it has become impossible to keep the Torah, and no sacrifice for sins is left. And it would probably be in bad taste to confront a Jewish person with the fact that Jesus predicted the fall of the Temple as judgment because the leaders of the day rejected him. Although saying so is factually correct, it misses the most important point: not that Jesus was the downfall of the Temple, but that he was the fulfillment of the Temple promise: the place where God meets man, the place where God hears prayers, the place of forgiveness, the beginning of a covenant for all nations. If we tell Jews about Jesus as the one who was the end of the Old Covenant, they will meet him with resentment; they will accuse their brothers who follow the Messiah of "converting to another religion". Better if we explain what the Torah did when the Word of God became flesh and tabernacled among us as Jesus the Messiah. It was Jews who took the Torah forth from Jerusalem under the banner of the Messiah. They took it to Egypt and the idols fell; Isis and Osiris and Horus and Ra became memories of the past. The Word of God did this, and Jews under the banner of the Messiah accomplished this thing. It was Jews under the banner of the Messiah who stopped the Assyrians and all the neighboring peoples from worshiping their false gods. The people who once led Israel astray were now cheerfully abandoning their false gods. The Word of God went to Greece and Rome under the banner of the Messiah, and Apollo and Zeus and Aphrodite and Hera became forgotten idols. Again it was Jews who did this, Jews under the banner of the Messiah. When the Jews list the accomplishments of their people, do they remember this? Better if we explain that God's Messiah, like God's firstborn nation, shared in suffering. Better if we explain that here is real proof of Jesus' Jewishness when he shares in the fate of his people: everybody likes his ideas but nobody wants to admit he's Jewish. And so many people misrepresent him, scorn him, mock him, make snide comments about him without really knowing what he said or did. In this way Jesus is very, very Jewish. In his crucifixion, he joins his people in being hated without cause, in being misrepresented, in being mistreated and executed. Jesus is proof that God has not abandoned, has not forgotten his people or his promises. He has remembered his people and his treasured possession. And finally in his resurrection, Jesus is God's seal on the promise of resurrection for all people. But for all that, we still have no neutral term for those books. All the terms we have looked at have some confessional weight: whether Old and New Testament, or Hebrew and Christian Bible. My alternatives of First Testament and New Testament, or Hebrew Bible and Worldwide Bible have their own confessional meaning, one which I am glad to stand by. If we want a value-neutral term, we might stick to "Tanakh." Myself, I will gladly call those books the Tanakh when I am looking for a non-confessional way to refer to them. What's in a name? When the question of the name comes up, I will take the opportunity to explain why I confess what I confess. In the opening verses of Genesis, reality is created almost as an echo of the Word of God. God names a thing and calls it to be, and it is. (Am I the only one who finds it interesting that the very first word spoken by God to create the world is a form of the verb "be" -- a conjugation of His own name?) Many of the most basic elements of creation -- light, water, rocks, wind -- are referenced time and again in Scriptures as icons of God, windows through which we catch glimpses of the reality of God. For today, I'll consider light. When God reveals himself, this self-revelation is often accompanied by light. Moses saw light in the burning bush when God revealed his name, light at Mt. Sinai when God revealed his Word, light that transferred to the face of Moses so that his face had to be veiled. The Hebrews saw light in the pillar of cloud and fire that led them from Egypt, light in the tabernacle where God's presence dwelled. Time and again light showed when the word of God was revealed or when God's presence was made known. Figuratively, the Word of God was said to be a light to the people. "Your word is a lamp unto my feet and a light unto my path." The Messiah was said to be a light to the people. "The people that walked in darkness have seen a great light." And "a light to enlighten the nations, and the glory of your people Israel." Paul shows what all the "light" references have in common: "The knowledge of the glory of God"; ultimately, this is in the face of Christ. I think Israel should have suspected all along that the true king -- the king to reign forever -- would be God himself. Remember God's comment when Israel asked for Samuel to give them a human king so they could be like the other nations? God said the people had rejected him as their king. So if God is their true king and had objections to a human king, why would he set up a merely human king for all eternity?